As a prisoner of war in a Nazi concentration camp, when Vitaliano heard the Americans were coming he managed to escape. How did he survive? Read on and find out! Vitaliano joined the Fanteria 19th regiment of the Italian Army and completed basic training in Nicastro, in the province of Catenzaro, Italy. He was sent to Crete,Greece, which was a very active area in World War II, with numerous bombings. “We were ordered to guard a crate of bombs. We were captured by the Germans and 50 soldiers were put in the hold of the ship and sent to Athens. We had to sleep on bags of cement and our skin turned white due to the cement dust and sweat. “When we reached Athens, the German guards were waiting to separate us into who was willing to fight with the Germans and who would not. Those who would not join the Germans were called traitors and sent to a concentration camp in Germany. “The ride on the train took 15 days, and we were given some broth by the Red Cross when the train stopped in Macedonia. There were 500-600 soldiers in this camp. They took 100 soldiers to a factory and they were ordered to make acid soda. “We were starving and had no food. We found some cabbages and ate that. Another soldier and I were taken by an elderly German man to help in the kitchen. There were Germans who wanted to learn to speak Italian, so I taught them Italian and they taught me German. I was given a position of trust and would go to the store with a mule to get food. “In 1944, when the Americans were coming, I ran away from the camp and made it to Belgium were I hid in a cave for two weeks. I found the Americans and they brought me to England. In England I was free and there was a lot of work. I worked in a factory and other jobs. At night I was free and I went to the movies; in 1946 I met an English girl and learned English from her. “I returned to Italy that year, and I got married in 1949. I came to Canada in 1960, and the English I had learned helped me immensely to get a job. 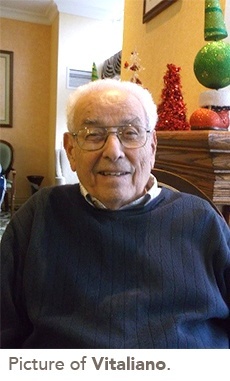 Today, Vitaliano continues to enjoy life at Villa Da Vinci Retirement Residence in Woodbridge, ON.